Some inspiring stuff for your summer practicing! Flute teacher Jennifer Keeney has created a website with inspiring flute practice advice, technique tips, flute etudes and exercises. Practice advice for Donjon, Andersen op. 30 , mp3s of competition etudes. And to give yourself visual information about James Galway's amazing fingers and to give your ears a fine listen to great tone and technique, have a look at these three excellent Galway films on youtube. 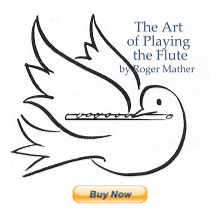 A thrilling capturing of flute history! Wow, that last video has great embouchure close ups, especially towards the end. Thanks for linking to it! You are so right Stephen. (I've added that comment to the main text above). So true. Close ups on embouchure *are* great in last video. You can really see the upper lip motions for high octave playing. but i just have a question :) how to contact you ? My flute teacher constantly yells at me for covering up the hole too much. She says that it produces poor tone quality and poor projection. But anyways, I just saw Sir James Galway's tone and embrouchure video on Larry Krantz's youtube channel. I see that he covers up a significant portion of the embrouchure. Is it a good idea to blow stright into the flute like James Galway does? I kinda do what he does. There are several different factors that can be misinterpreted when talking about "you are covering the blow hole too much". Firstly, the hole is uncovered more for the low register, and then the two lips move forward as you ascend up to the high register, where the covering is the most (up to 2/3rds). b) correct the sharpness of pitch in the high register. So over-covering is a different topic to "how much" covering is used from the lowest register to the highest, because the two items can look the same, but are not the same. Secondly, over-covering (the rolling inward of the blow hole) is a common flaw in anyone who plays the flute. One day you're not overcovering, and the next day you are. You can hear it in the sound, and the "over-covering" sound comes and goes unconsciously. Suddenly, you hear it and you realize: "I just rolled my flute in two millimeters too far while I was playing." This is what flute teachers can hear. The sound becomes "edgy" and small, and terse, and "dark". This is common.Everyone does it by mistake. Often because the flute just gradually rolled in by itself. Sometimes too, flute students go thorugh a period where they have let the flute roll too far inward and have been overcovering for weeks at a time, and haven't noticed it. That's the time when the teacher has to remind them that you can HEAR the sound of a flute that's too rolled in. It sounds squelched, dark, and small in harmonic spectrum. It doesn't project well. So it's up to you to discover the two different ways at looking at how much the two lips are involved in over-covering, under-covering, or aiming correctly to get the right sound, by using your ears. If you roll out "two milimeters" more than you think you should, and move the lips forward, softly off the teeth, so that your lips have a longer inner-membrane shaping the air-jet, then you will have more ability to shape the sound quality, easier time leaping wide intervals, and have better tuning and dynamic changes. But if you unconsciously roll inward while playing, and don't notice the sound change, you will have an edgier sound, with less projection that's more work to produce. So differentiate firstly between those two items, and then I'll talk about Galway's embouchure below. James Galway's embouchure hole coverage is actually the result of the acoustics of how he's playing in the videos you are watching. 1. He is playing no quieter than a full mezzo forte. Even his "pianissimo" is more mezzo forte than the typical student thinks would be a true "pianissimo". So he is not uncovering the blow hole very much in his dynamic range; he's very much covering fully to avoid sharpness or shrillness, and playing with a projecting tone as one must in a large hall or to be heard over an orchestra. 2. Most of the showpieces Galway is playing have a great deal of third (high) octave passages. This would require him to play with the two lips forward and with the lower lip covering up to 2/3rds of the blow hole. Often these passages are the ones where you are seeing camera close ups. When he takes his flute down to show the class the skin marks on his lower lip coverage, the marks are the result of playing high register in the pieces he's just played and practice. The markings obscure any low register pianissimo markings that his skin would have left on the flute. Using a taller lip opening to get a more brilliant sound while playing a full mezzo forte is the skill that's usually missing in a student who's playing too covered. Get your teacher to demonstrate the difference between too rolled in, and rolled out enough, two lips foward to shape the air jet, plus raising the center of the upper lip to add high partials back into the sound; and you will finall hear the difference between the sound you're making and the James Galway sound. It takes awhile, but being sufficiently rolled out to allow the lips to travel forward is the key to the whole thing. Sorry to talk so long, but this is a particular item of interest to me.